Today was just one of those days when you feel like there’s just one more thing, and then one more to get done. The domino effect was definitely in order. You know how it starts. 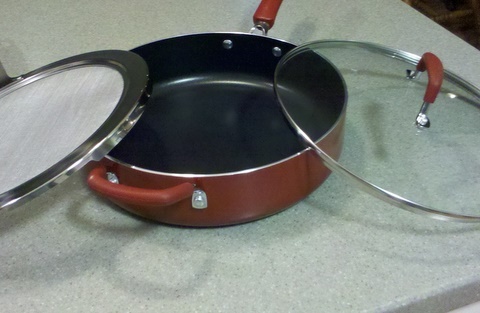 You buy a new and wonderful sauté pan. 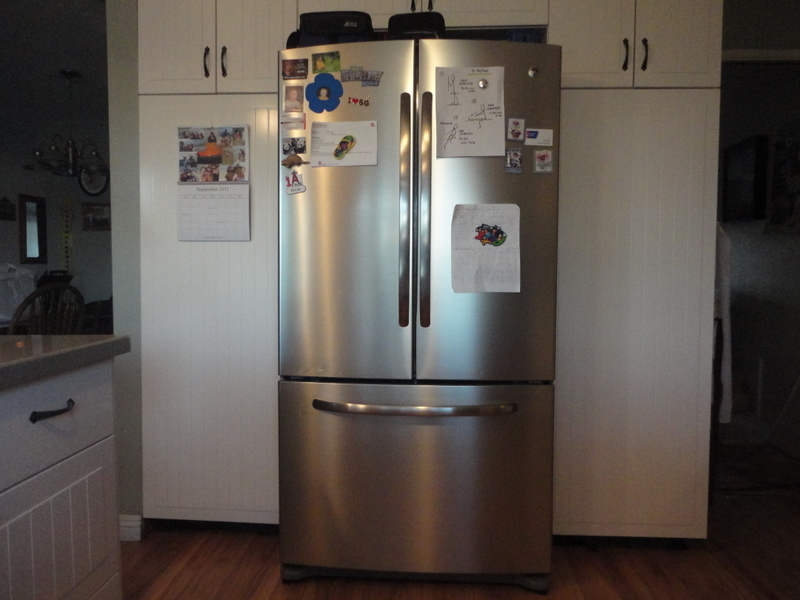 It will fit into your corner cabinet beautifully, once you throw away the old pan that it is replacing. You venture into the corner cabinet to find the old pan, and voila you start cruising all of the pans and lids to find out if you should get rid of anything else. Like lids with missing pans or vice-versa. Then once you have all of the oldies out-of-the-way you go about the job of re-organizing, wiping off all of the shelves, and there it is a clean and tidy cabinet. Yay! Then it was on to the unfinished baseboard in the family room. This has been really nagging at me for a few months. I don’t always tell Travel Man when little things like this are bugging me because we always have more important issues to discuss and worry about when he is between trips. But we decided today was the day to finally finish the baseboard. A little bit of caulking, a coat of paint, and voila the baseboard are finished. Yay! Such a short amount of time, but so rewarding to get these little things out-of-the-way, and get all the little remodeling details done! Next we’ll be tackling the trim pieces around the bottom of the kitchen cabinets, and the voila another thing off of the long honey dooooo list. Recently, at the request of Travel Man, I started making a Reneedoo list (things to get done while Travel Man is away). My list usually involves the things that need to get done so when Travel Man is home the dominos fall back on his list. So far this system has been working. It’s still in the baby stages, but we’re hoping to graduate to kindergarteners on the “Honey/Renee – Do’s” very soon. My next self-inflicted chore it to tackle my pantries. I have two huge pantries on either side of my fridge. The pantries are the lower cabinets portions in this picture. Very handy. They have slide out shelves, so you can only imagine what can accumulate there in a years’ time. It will be just as rewarding, I’m sure to get this task off of my cleaning list. I’ll let you all know how that goes in a few days! Wish me luck. Have you had the cleaning/organizing bug in your house lately?